It is ideal that dogs live indoors. Indoor living helps the dog bond and become a part of the family and is also the easiest way to protect pets from the dangers of the outdoors. The majority of dogs do enjoy quality time outdoors. The outdoors is great for playing and exercising. Always make sure your pet is contained by a leash or fence when outdoors. Only well trained, working dogs should ever be off leash, such as police dogs or hunting dogs in the field. Some dogs live primarily outdoors. Outdoor living can be acceptable as long as the dog is well cared for and its basic needs are met. 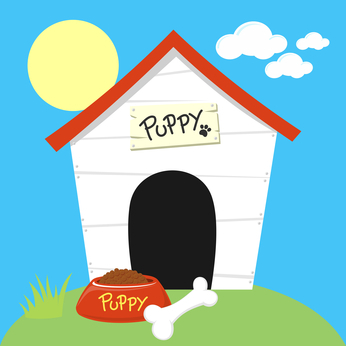 All outdoor dogs need a shelter or dog house to keep warm and dry in and to provide shade in the summer. The dog should have access to fresh, unfrozen water at all times. It is best that outdoor dogs live in fenced areas. It is not recommended to keep any dog on a chain or tether for long periods of time. This is not healthy for the dog and can create a frustrated animal that can pose potential danger to humans and other animals. Most counties require that all dogs and cats be vaccinated against the rabies virus. After the vaccine is administered, the dog is issued a tag to attach to its collar. The tag is made to be visible and easy to identify a dog current on its vaccine. The rabies tag often corresponds to owner information. This can be a way to determine ownership of stray animals. Additional identification tags can be purchased at local pet stores or online. These tags are meant to easily identify the animal and provide owner information. Most have the animal’s name and the owner’s phone number and/or address on them. Identification tags can be the quickest way to reunite lost dogs with their families. The microchip is the size of a grain of rice and is inserted in the skin on an animal’s back. This chip contains a numerical code that can be read by a scanner and corresponds to owner information. Microchips are highly recommended because they can identify animals that have lost their collars and the additional tags. It is important that microchip owner information is updated every time there is a change in address or phone number. Healthy dogs require proper medical care. The majority of preventative care, such as vaccines, are done on a yearly basis. Some procedures such as spaying or neutering are done once and dental cleanings may be every few years or as needed. It is important to love your pet, but it is also important to be able to provide proper veterinary care. Basic and routine care of a dog can be quite expensive. There is also a chance that the dog may need additional medical care or treatment during the course of the year. It is wise to make sure that your pet has a fund or insurance policy in case of emergencies. There are a variety of dog foods to choose from. There are lower end, mid end, and quality foods. There are also specialty foods, such as sensitive skin or stomach. It is best to do research into individual brands, different breed recommended nutritional needs, and your dog’s personal needs. Working dogs may require a different diet than general companion animals. Lower end foods do tend to cost less, but often can be less nutritional, require your pet eats more to feel satisfied, and produce more waste from your pet. Most pets can be healthy on mid to high quality foods. Many breeds of dogs require regular grooming visits. These visits usually range from every 6-8 weeks and can vary by breed in price. Dogs that are not groomed on a regular basis can become matted and tangled. Being matted can be very painful to the pet. It is very important to a dog’s health that grooming needs are taken seriously and the dog’s coat is maintained properly. Every dog should wear a collar with proper identification attached. There are many types of collars to choose from. There are nylon/leather collars, choke chain collars, pinch collars, and harnesses. Each collar is designed for a different purpose. Nylon/leather are standard collars with a plastic or metal buckle. These collars are ideal for pets that walk easily on a leash. Choke chain collars are metal collars meant to “choke” the dog when they pull. These collars can be effective in controlling a dog, but can cause damage to the dog’s trachea. Pinch collars are designed to “pinch” the skin around the dog’s neck when they pull or get out of control. The pinching is to deter the dog from unwanted behaviors. There is some debate on whether choke chain and pinch collars are appropriate collars or border on being inhumane. 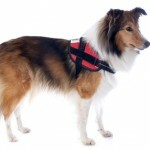 The harness is designed to go around the dog’s midsection and back. A harness reduces the amount the dog can pull and does not put pressure on a dog’s throat and trachea. Harnesses are considered effective and humane. Most communities have leash laws, which mean the majority of dogs are required to be leashed when they leave their property. There are several types nylon/leather leashes with different styles and grips/handles. The majority of leashes are effective and appropriate in controlling a dog. The only leash that is not recommended is the retractable leash. This leash usually has a plastic handle and a thin piece of nylon that attaches to the dog’s collar. The handle has a button that lets the handler control how long or short the leash is. The retractable leash does not give the handler proper control over the animal. The thin piece of nylon does allow the dog to be in control and to get too far from the handler holding the plastic handle. There are optional dog supplies that owners may choose to purchase for their pet. These items include food dishes, beds, and coats. Currently, the pet industry is a booming industry and many items for your pet’s lifestyle and comfort are on the market. Each individual owner can decide what items to purchase and at what cost for their dog. Many items may improve the quality of life for the pet, but may not be a necessity. The majority of dogs require playtime and plenty of exercise to burn calories, stimulate their minds, and help satisfy their natural urges. 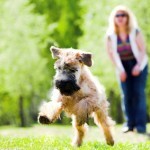 Dogs that don’t have enough physical and mental stimulation tend to get bored, which can lead to destructive behaviors. Destructive behaviors can be costly to the owner and often can lead to a dog being surrendered to a shelter or re-homed. The amount of exercise and play necessary for a dog depends on breed, age and the individual dog. Breeds in the sporting, herding, hound, and terrier groups generally need more exercise and activity to meet their needs than breeds in the toy and non-sporting groups. Correctly used, choke chains are not used . to choke. They are used to make quick tugs with a leash to get the dog’s attention. If choke chains are choking, they are not being used properly. Head halters can be great training aids, as they give the handler control of the head. Prong collars can be helpful, but they can irritate a sensitive dog. Body harnesses, in my opinion, have no value in training. They can pinch the forelegs together, restrict the movement of the forelegs, or irritate the dog in the axillary region. They might look nice to the public, but they don’t allow free movement of the dog. Some harnesses are just made to be pretty and not to give any control. Essentially, all dogs need training. The control of the dog starts at the head and neck. That is also where the training control needs to be. Furthermore, all training devices can be abused.